Warfare survival was a significant factor in body armor development, which included armor production’s economic and technological necessities. 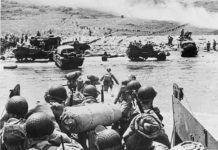 Body armor creation was a major technological evolution in warfare history. Body armor increased the likelihood that warriors would survive combat operations. Body Armor is combat equipment designed with various materials, but usually of metal, employed to protect a warrior’s body during violent combat. The warrior’s shield is the oldest defensive military equipment piece; a wide belt to protect the stomach was another piece of early body armor. Although body has been primarily used for defensive maneuvers, shields can be employed for offensive attacks. During 3000 BCE, ancient Egyptian war belts were developed into a wraparound garment extending from armpits to knees, they wore quilting reinforcement, and they wore shoulder wraps to hold up their armor. In 1,400 BCE, the Syrian the national armor involved a sleeved shirt with bronze scales reinforcement and employed as charioteers’ armor, who were unable to hold their shields due to both their hands being occupied. The scales were sewn onto a fabric backing and were laced together in lamellae flexible rows. The ancient Sumerians were the first to use helmets, in the form of tight-fitting beaten copper caps, during 3000BCE. Assyrian helmets were conical bronze caps with small earflaps. 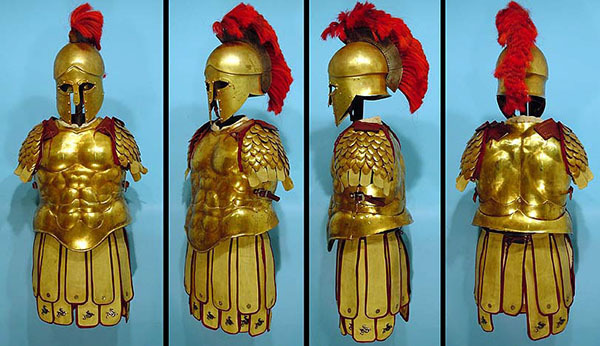 The Scythians and the Greeks wore both scale and lamellar armor. Greek armor was a quilt reinforcement wraparound with wide shoulder flaps; its lower part was a skirt of loose strips A hammered bronze plate cuirass or thorax realistically embossed to portray naked torso muscles was worn to protect the warrior’s back and chest. Greek body armor was designed with bronze greaves, a bronze covering for the lower legs, and a round ox-hide and bronze shield. The hoplite warrior’s helmets were designed to enclose the whole head; the Y-shaped opening for eye-slits and for breathing was the perfect helmet form. Roman soldiers wore protective armor when charging into battle. Their helmets were designed to protect their necks, faces, and heads without blocking their hearing or vision. The Roman soldier’s wore leather straps holding metal strips together on the inside to protect their shoulders and torsos. Their body armors were heavy and flexible. Roman soldiers assisted each other when putting on and lacing up their body armor. The Roman soldiers’ cuirass ornament was a Greek armor adaptation and modification that existed in three basic versions: the Lorica Segmentata, constructed horizontally with overlapping iron plates; the Lorica Hamata, made of chainmail with interlinked iron rings; and the Lorica Squamata, with bronze scales on a leather backing. Roman helmets, made of bronze and iron, had movable cheek pieces. The large rectangular Roman shield gave each soldier excellent protection from head to foot. During the 11th century, it became acceptable battle technique for knights to charge their opponent with the lance couched or held under their right armpit. The left, or shield, side of the knight was always turned to the enemy. Therefore, the knight’s former oval-shaped shield was modified in an elongated form with a sharp lower point, designed to guard the horseman from their knees to up to their eyes, but this protection locked the knights into a very rigid fighting position. When a face-covering visor was developed and added to the helmet, the shield’s upper portion was made straight; and when solid knee protectors and plate greaves developed, the lower point of the shield was shortened. Identification markers were placed on knight’s shield because the visor made the knight’s face unrecognizable. The crusaders wore a sleeveless undergarment over their mail armor to protect themselves from the burning heat emanating from the hot Middle Eastern sun; these undergarments too became emblazoned with heraldic emblems and were known as the celebrated coats of arms. During the early 14th century, the superior crossbows’ bolts were able to penetrate chain-mail with great ease. Therefore, deflecting surface armor became necessary. By the mid-14th century, full plate defenses for arms and legs developed along with small plate riveted body armor inside the undergarment, known as a coat of plates. While the loose-fitting mail shirt was slipped on over the head, the coat of plates had to be tight-fitting and opened in front. The fighting position was with the left, shield-protected side toward the enemy; to deflect sword blades and spear points; therefore, their coat of plates was buckled with the left sides extending over the right sides. During the early 15th century, completely articulated Gothic plate armor developed. This armor was called Gothic because it was decorated with vertical lines and its spiky silhouette was reminiscent of Gothic architecture. By the 16th century, the style changed, with the more rounded shapes characteristic of Renaissance style dominant; a variant favored in Germany for its additional strength had fluted surfaces, like corrugated iron. While a knight in full armor was almost invulnerable to pointed or edged weapons, the impact of a soft lead bullet could break an armor plate. Thus, as guns and gunpowder technology replaced older weaponry, armor began to be modified. Thicker plates afforded needed protection against bullets but greatly increased the weight of the armor. Thus, by the late 16th century, overall protection was sacrificed in favor of partial armor; by the mid-17th century only the cuirass and helmet survived. During the 18th and 19th centuries, cuirasses were still used as protection against sword cuts. During the First World War, although many soldiers were protected inside a trench or foxhole, steel helmets were required to protect military personnel against shrapnel. In 1915, the German Army was the first to introduce such helmets to its fighting men. Armor in steel helmet form and flak jackets are currently employed in modern warfare. The flak jacket and helmet designs have save many soldiers’ lives fighting in Afghanistan, Iraq, and elsewhere. Apart from military employment, armor in visor helmet form, bulletproof vests, and shields is essential for modern special police work. The Book of War; Dwight Jon Zimmerman; 2008. The Book of Weapons; Dwight Jon Zimmerman; 2009. The Book of Inventions; Thomas J. Craughwell; 2008.